The Living Building Challenge is a green building certification program by the Cascadia Green Building Council that defines the most advanced measure of sustainability in the built environment possible today and acts to diminish the gap between current limits and ideal solutions. Projects that achieve this level of performance can claim to be the ‘greenest’ anywhere, and serve as role models for others that follow. The Challenge is comprised of seven performance areas, or 'Petals': site, water, energy, health, materials, equity, and beauty. Petals are subdivided into a total of twenty Imperatives, each of which focuses on a specific sphere of influence. This compilation of Imperatives can be applied to almost every conceivable Typology, or project type, be it a building (both renovation of an existing structure, or new construction), infrastructure, landscape or community development. 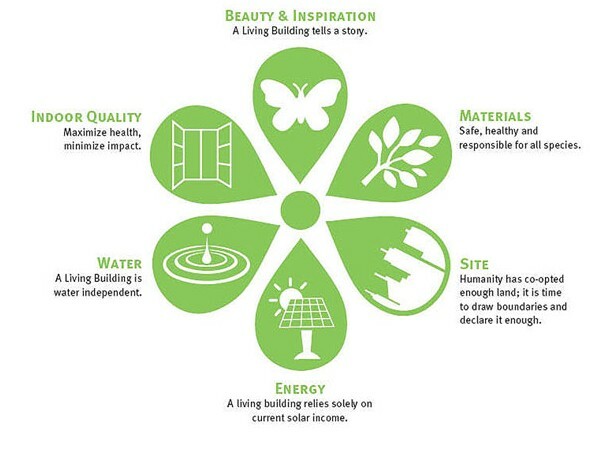 Learn more about the Living Building Challenge by downloading the full Living Building Challenge Standard.